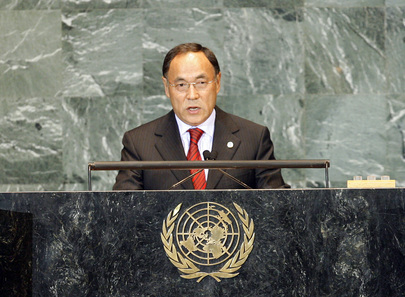 UNITED NATIONS, February 4 -- Two months after the UN sent retired Major General Patrick Cammaert to Sri Lanka, his report on Children and Armed Conflict in the country was presented to that sub-committee of the UN Security Council, in a closed meeting in the UN's basement. The report, a copy of which Inner City Press obtained and exclusively puts online here, notes among other things the re-recruitment of children by a "commander named Iniya Barrathi who was part of the TMVP breakaway faction under Karuna's leadership." Cammaert recommends that that government take action. But in the meeting, a move was afoot to "de-list" Sri Lanka, from its one connection to the UN Security Council. During the bloodbath on the beach in 2009, despite tens of thousands of cilivians killed, Sri Lanka was never put on the Council's main agenda. A few meetings were held, informally, in the basement. Children and Armed Conflict, a committee of the Security Council, retained Sri Lanka on its list. It was in this context that Cammaert belatedly went to the country. His report also calls for wider accountability and investigations. But even the UN's Ban Ki-moon, who visited Sri Lanka in May for what many called a "victory tour," has not called for or begun any investigation. The report has other examples of children still impacted. Cammaert writes of a "visit to the Poonthotam primary school [in Vavuniya]. Half of the classrooms are currently being occupied by the Sri Lank Army (SLA) to host adult surrenderees, disrupting the education of more than half the student population." 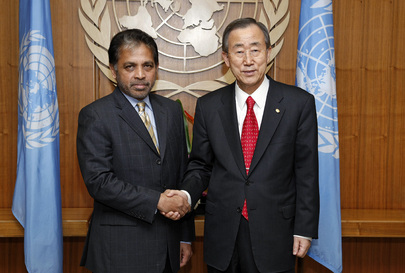 With all this unaddressed, Sri Lanka's Ambassador to the UN Palitha Kohona was seen on February 4. He spoke to BBC, he was congratulated in the closed door meeting on Children and Armed Conflict. On February 5, he has invited UN diplomats and select scribes from countries like China to a concert at the Rajapaksa-friendly Asia Society. While Kohona has been missing from the UN in New York for some time, he was still working, calling Ban Ki-moon's chief of staff Vijay Nambiar to try to get canceled a press conference on Sri Lanka by UN Special Rapporteur on Executions Philip Alston. Ban later distanced himself from Alston and his call that Ban start an investigation. Why cancel the Children and Armed Conflict meeting, if it was to be a venue for celebrating the bloodbath on the beach and lobbying to de-list Sri Lanka from this last UN list? Watch this site.